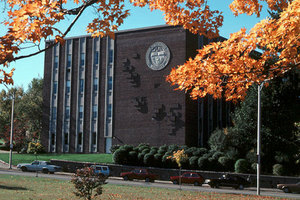 In 1965, Goddard Hall was constructed to provide a new home for the burgeoning departments of Chemistry and Biochemistry, and Chemical Engineering. The building was funded by a gift from the F. W. Olin Foundation and named after Robert Goddard, the famous 1908 WPI graduate who is known as the father of modern rocketry. Its exterior features a 10-foot-tall WPI seal cast in stone. In 2008, the George I. Alden Trust funded a major renovation of Goddard Hall, enabling the creation of the George I. Alden Life Sciences and Bioengineering Educational Center. The 21,300-square-foot center features four floors of open, technology-rich spaces for undergraduate biology, biotechnology, biomedical engineering, chemistry, biochemistry, and chemical engineering programs. The layout also promotes collaborations across disciplines and among students through shared work spaces, tutorial spaces, and study lounges.